Let’s wind the clocks back about one year’s time. It’s going to be a somewhat unpleasant trip, but bear with me. Given where we find ourselves today, it should be just a little bit easier to bear. Coming out of last year’s Battleground show, the landscape in WWE was not one that inspired confidence in the future. The Undertaker and Brock Lesnar were set to be the focal point of SummerSlam, which, were it not for a terrific pull-apart brawl, would have done shockingly little to capture the imagination of most. Seth Rollins was being slotted to defend his WWE World Heavyweight Championship against John Cena, creating the idea that the 15-time champion may once again retake his place at the top of the heap after settling nicely into his role as United States Champion. Roman Reigns, though temporarily out of the championship picture, was milling around in an interminable feud with the Wyatts that seemed clearly intentioned to keep him busy until his number was called again. Dean Ambrose was there, too, but he seemed to just be along for the ride. Randy Orton and Sheamus were feuding. The less said about that, the better. Moving on. The Divas Revolution was failing, Kevin Owens seemed primed to start floundering after losing his second straight match to Cena, and all programing was still being held in the vise-like grip of The Authority. SummerSlam, marketed as the “Biggest Party of the Summer,” felt like it wasn’t going to be any kind of special soiree. If anything, it felt like it would be more of the same song and dance. Let's fast forward back to the present day and the fallout from this week’s episode of Raw. Since last Tuesday’s WWE Draft and through Sunday’s Battleground show, WWE has been pushing the hard sell that this week’s Raw would mark the beginning of a new era. Sure, there would be a new logo, a new set, exclusive roster, and a new general manager in Mick Foley, but it was hard to actually take the idea that WWE would significantly change anything else for the better on faith alone. And then, Raw happened. If it was not the start of an exciting new direction, at the very least, it did a damn good job of impersonating it. In one night, WWE made Finn Balor a main roster superstar, and it did so in the absolute easiest way possible: giving him a clean, convincing win over one of the company’s bigger stars in a match that played to his strengths and made him look like a million bucks. It was so simple and so effective that one has to wonder why WWE didn’t take the same approach with so many others who came before him, and whether or not they will learn from its success when building new stars in the future. What’s more, the fact that Balor’s place in the match against Seth Rollins at SummerSlam for the WWE Universal Championship comes at the expense of Reigns suggests that, at least for now, the reality of Reigns not being over to the level of the company’s top babyface finally overwhelmed the unrealistic expectation of what he should be. With an unprecedented third clean pinfall loss in a row, it is clear that something has changed when it comes to the opinion of Reigns, and it seems to signal a downward trajectory for his character moving forward. But if WWE plays it smart, it can capitalize by easing off the gas pedal and allowing Reigns to tinker with and improve a stale formula away from the glaring spotlight of the main event. Eleven months removed from a legendarily terrible Miz TV segment that pretty much sunk the illusion of the Divas Revolution, Sasha Banks captured the WWE Women’s Championship from Charlotte in a terrific match that delivered a clear story with great execution and a satisfying payoff. Without so much of a breath about anything involving a # or a revolution, WWE finally opted to show and not tell, letting the audience glean the importance of the moment from the moment itself. By letting the moment live and breathe, and by treating it with an equity of magnitude, it felt more like a shattering of glass ceilings and expectations and less like a marketing ploy. Where so much concern had fallen on the likelihood that Raw would become overwhelmed with the drama that was sure to unfold between Stephanie McMahon and Mick Foley, Raw delivered a show that was unbelievably Stephanie-free. Apart from appearing in the first segment to announce the WWE Universal championship and lay out the format of the show ahead, Stephanie and Mick were nowhere to be found. The show was none the worse for wear for their absence, and it hummed along for most of its three hours with very few screeching stops. It is hard to believe that there isn’t something coming -- Seth getting a pass into the championship match at SummerSlam surely indicates the dark waters of heel commissioner Stephanie McMahon looming ahead -- but for the time being, there is at least hope that someone has realized that less is more when it comes to on-air personalities. 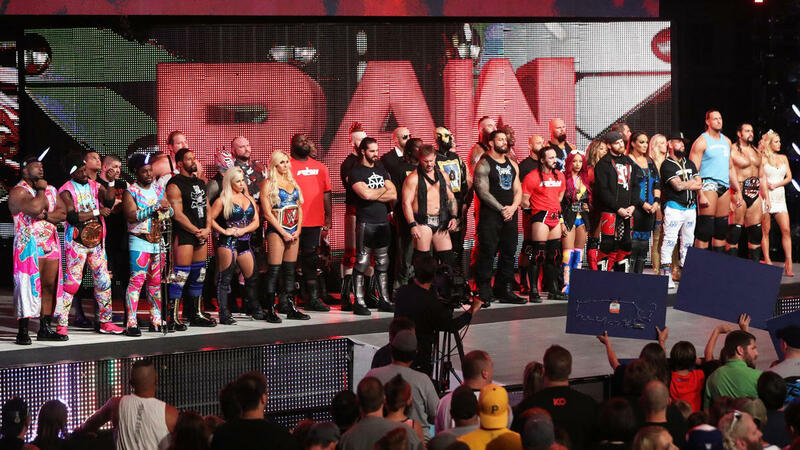 Rather than shoehorn several half-developed ideas into three hours and hoping for the best, Raw focused on a few threads at a time -- the crowning of a new champion, the build toward crowning another, establishing two new monsters, bringing back a returning superstar, and pushing a couple of tag teams. It was a wrestling show that was flush with actual wrestling that, while varying in quality, felt like it actually fit in the scheme of a balanced presentation. Even the show-long comedy angle of R-Truth and Goldust chasing Pokemon paid off in such a way as to make it pretty inoffensive. And, hey, give credit where it’s due to WWE for making a timely pop culture reference for a change. Where important names like Sami Zayn, Kevin Owens, Cesaro, Rusev, and Rollins were very much downplayed, a second week of the same formula would potentially focus on advancing their storylines heading into SummerSlam. This was a three-hour show that didn’t feel too overstuffed or threadbare, and the prospect of rotating spotlights for talent on a week-to-week basis is enough to keep the show fresh and keep the viewers tuning in. Looking up and down the show, it was not a perfect Raw; however, it certainly was not all that far off. With a show like Monday’s, it is hard not to want to check back in next week to see what sticks from that winning formula. History tells us that plans can (and will) change suddenly and without warning, but with just one show, there is hope enough that perhaps a new era is actually underway. Think back one year, and then think back to today. Dean Ambrose is the WWE World Heavyweight Champion. Finn Balor and Seth Rollins are wrestling one another at SummerSlam for the top singles title on Raw. Shinsuke Nakamura will be wrestling Samoa Joe for the NXT Championship that same weekend. AJ Styles is one of the most popular performers on the roster. The word 'Diva' is now verbum non grata. One of the hottest shows on the WWE Network is the Crusierweight Classic. The best match of the year in WWE (certainly in terms of in-ring storytelling) could be Battleground’s match between Owens and Zayn. The only thing that is constant is change. So much has changed for the better in a year’s time, and so much more seems to have changed for the better in just one night. It’s enough to make even the surliest skeptic think that perhaps in a year’s time, things might be even better.